Mount Zion Spiritual Baptist church North London UK. Mount Zion Spiritual Baptist church North London UK. 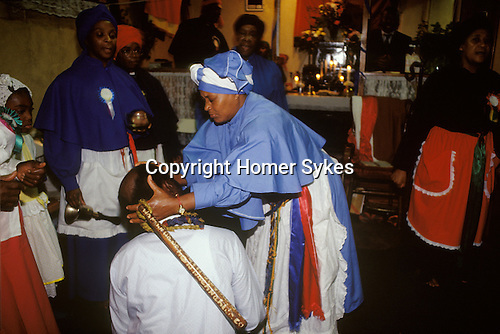 Mother Noel places a "spirit wand" over the body of a man and stretches the man neck back and forth and from side to side so as to drive out evil spirits, exorcises them from his body. This church service takes place in the front room of a small terraced house in north London. It is not entirely Christian.